Mummy-Tips: I want a Sophie the Giraffe..well I really want a pet duck but DH says NO! I want a Sophie the Giraffe..well I really want a pet duck but DH says NO! Any one of my children will confirm that I have a bit of a thing for retro toys and scabby hairless stuffed things from days gone by. I purchase whenever I can on our regular Sunday car boot outings, trying to make the kids love them. So bad has it become that the girls now spot the said dog eared and well loved item, point but don't touch (they don't know where it's been) before saying that I have to buy it as it's too ugly for anyone else to love. I do like to point out to them that it isn't a very nice thing to say and I do hope that no one ever says it to them! Anyway I digress - as my todays offering is not scabby or dog eared but simply a fantastic toy that has stood the test of time. 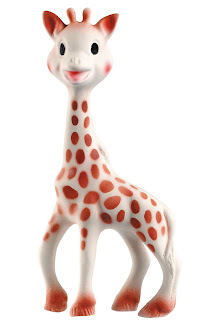 Born in France in 1961, Sophie the Giraffe quickly became a 'must have' baby buy. It was designed to stimulate the senses and to soothe sore teething gums. Since it was launched over 10 million little Sophies have been sold and 6 out of every 10 French babies own one. Made from flexible, renewable, natural rubber and non-toxic paint, it's a safe and all natural teething aid. Oddly for this fast paced world that we live in, every single is made by hand. I love the retro design, Sophie fits right in with my collection of odd balls and childhood memories. It's one of those products that makes perfect sense, that you would want to treasure forever.